Growing up my dream was to become a teacher. When I look back there are several teachers who had such a profound impact on my life; They encouraged me to pursue my passions and, simply put, knew how to make learning both fun and meaningful. Fast forward 20 years later and I am Manager of School Programs at the Museum at Eldridge Street. 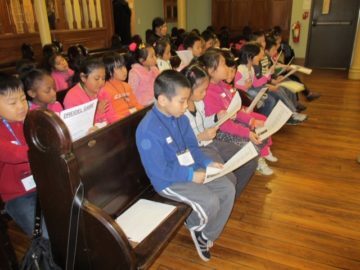 My classroom is a landmarked nineteenth-century synagogue and each year we welcome over 6,000 students to our building! Our students range from Pre-K to college and they travel here from throughout the city, the nation and the world. Our students are a wildly diverse group, too – some come to learn about their Jewish immigrant heritage, others are first or second generation immigrants and some are even stepping foot into a synagogue for the very first time. At the end of my tours I make a point of having students thank their teachers for bringing them to the museum. Why? Because it takes a lot of planning and dedication for teachers to set up field trips for their classes. They do the work that allows me to share our Museum with students. In my four years at Eldridge I have come to know many of the teachers who visit. Many of them have been bringing their classes to us for years. To celebrate these people and the important work they’re doing, I am excited to be launching a new series called The Teacher Spotlight. Each month, we will interview a different teacher about their experiences, their time as a teacher, and their thoughts about the Museum. Kicking it off for April is elementary school teacher Arlene Grosdorf. 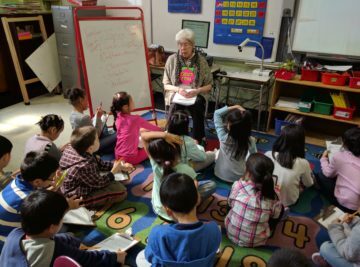 Arlene has spent over 40 years teaching 2nd and 3rd grade at P.S. 1, a neighborhood school in Chinatown. Even though she’s officially retired, Arlene continues to volunteer at P.S. 1 working with English Language Learners and at-risk students. She was bringing her classes to Eldridge Street before the restoration was officially complete! And now she continues to coordinate class visits to the Museum. What made you decide that you wanted to become a teacher? I think becoming a teacher stemmed from my early experiences as a camper at a six week summer camp during summers in upstate New York. The skills I acquired came easy: learning to chop wood, building a fire, making blanket rolls to sleep in for overnights in the forest, working with bunk mates to make breakfast the next morning. All, lots of fun and the sense of independence and excelling felt good. As I got older, the next step landed me as a counselor at the same summer camp, in charge of a group of 9 and 10 year olds. I enjoyed teaching the same skills that I had learned earlier and enjoyed designing and implementing activities for the kids. I would say those experiences were the seeds that led me to become a teacher. Eventually I landed a teaching position at P.S. 1 in Chinatown where my career began and still continues. Arlene’s class at the start of a Museum tour. How did you discover the Museum at Eldridge Street? What was your reaction when you walked into the main sanctuary for the first time? Where do I begin! I had been passing this interesting building on Eldridge Street for many years as I was growing up. It was most puzzling, it never seemed to be open. It almost appeared abandoned. In time when I had been teaching for a while at P.S. 1 about 30 plus years ago, a flyer was posted on the school bulletin board inviting classes to visit the Eldridge Street Project. It came with caveats: children needed to wear warm clothing, parents had to sign a release allowing their child to visit the dusty building. This sparked my interest! Finally, I’d get to see what was hiding inside this building. Not long after, off I went with 28 energetic third graders in hand. The doors opened and we were invited in. The kids noticed the dusty floors, the pews askew, damaged walls, peeling and missing paint. It didn’t smell so clean either and it was really cold! One student commented, “What a mess!” We began to hear the story of this place and saw old photos. We heard how the building began over 100 years ago as a place for Jewish immigrants, new to this country, to gather freely and pray. My class spoke about their own families who were immigrants from China. We left that morning with much to discuss and write about. Students began to understand what it was like to move to a new land. My class pledged to return again to help clean up the building so other classes could visit. Why did you decide that the Museum at Eldridge Street would be a good place to bring your students? What do you hope they will come away with from their visits? What can I say? I have spent most of my professional life involved in some way with the varied programs at the museum. As a school , we try to provide opportunities for students to connect and learn about the people and resources in our community and to experience and develop understandings of the world around them. To that end, the Museum at Eldridge Street has been a treasured and remarkable resource. Every year we have multiple classes sign up for the fabulous holiday programs of Chanukah and Passover. Children experience the stories, language, songs, food and relate them to their own Chinese and Hispanic celebrations. So much language spoken helps our students with their English acquisition. Through these many experiences, my students develop language proficiencies, learning and practicing new vocabulary. They interview family and write about how it feels to move to a new home. Our kids experience and appreciate the celebrations of different cultures. One of the most indelible memories took place over 10 years ago. I worked with Eldridge Street educator Annie Polland on a new program which focused on the historic Lower East Side marketplace and how Jewish immigrants bought and sold things. We then learned how it compared with the markets in today’s Chinatown. The students viewed old photos, bargained for pickles at a pickle store, walked the neighborhood and recorded observations. 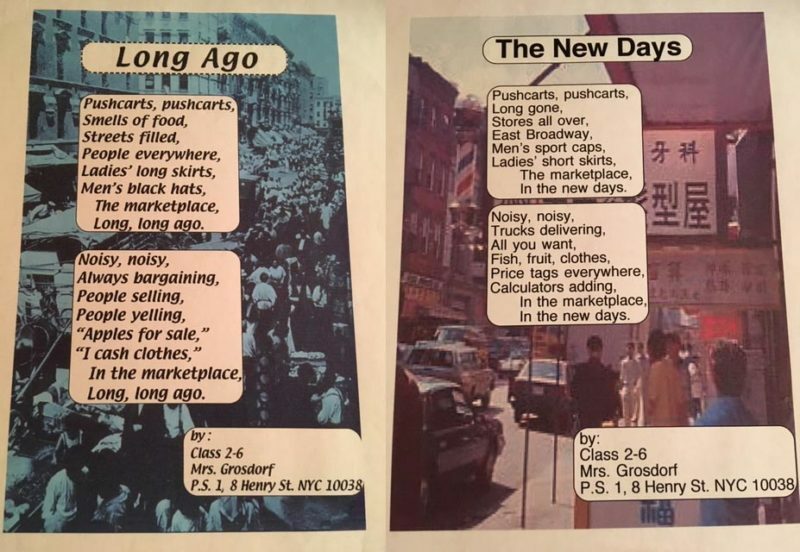 We collected and organized our information and, as a class, composed of two wonderful poems titled “Long Ago” and “The New Days.” Before we knew it, an invitation arrived to recite our poems at Eldridge Street’s new block party Egg Rolls & Egg Creams. On a warm day in June all of my students gathered and recited their poems to a synagogue filled with joyful families. What a day we had! Little did I know back over 30 years ago that I would encounter such an amazing and exquisite building resource right near our school. We at P.S. 1 are so appreciative of our wondrous neighbor on Eldridge Street! Arlene’s class composed two poems describing the Lower East Side past and present. I’m so grateful to Arlene for talking with me about her work! And to all our New York City educators for helping us share Eldridge with our students! Stay tuned next month for another Teacher Spotlight. Rachel Serkin is the Manager of School Programs at the Museum at Eldridge Street.